COMplex PATHs in Human EVOLution is a team-science unit (including researchers with backgrounds in archaeology, history, physics, and social sciences, among others), conducting transdisciplinary-oriented research. 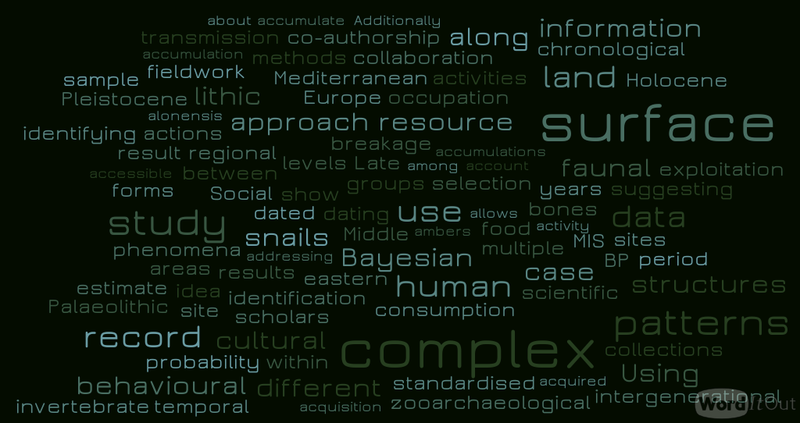 a) Long-term demographic and socio-ecological processes from the statistical treatment of archaeo-palaeontological data. b) Cultural dynamics through mathematical analysis and computer simulations in both prehistoric and historic periods. Our portfolio of projects, which reflects COMPATHEVOL's efforts to broaden the trans-disciplinary approach of IPHES, includes the study of human adaptation to postglacial climatic changes from fieldwork at archaeological sites like Casa Corona and Villena; the application of network analysis to regional organization of early farming and proto-urban societies; and modelling of the spread of technology during the First Industrial Revolution in Spain.